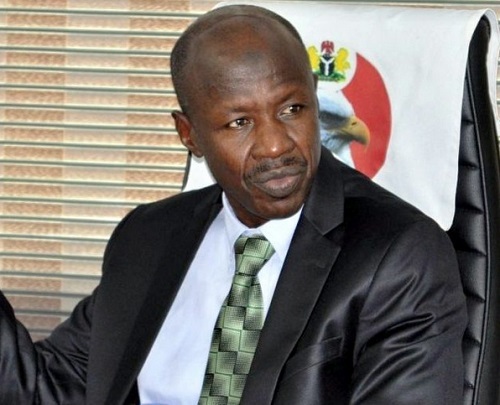 The Economic and Financial Crimes Commission says there is no connection between the detention of former Secretary to the Government of the Federation, Mr Babachir Lawal, and former President Olusegun Obasanjo’s strongly-worded letter to President Muhammadu Buhari. Acting Spokesman of the commission, Mr Samin Amaddin, said in Abuja on Friday that both incidents were coincidental and contrary to insinuation in some quarters. Lawal was detained by the commission on Wednesday, barely 24 hours after Obasanjo issued a statement accusing the present administration of shielding its corrupt allies. The timing of the EFCC’s action on the former SGF sparked speculation by some Nigerians that the government is either trying to divert attention from Obasanjo’s statement or appease the former leader. But Amaddin dismissed the suggestion, saying Lawal was invited by the commission long before the former president issued his statement. “When we are doing investigation, we don’t have a fixed time. Those speculating should have realised that several contractors are involved in this matter, and they were all invited, even banks. “We have been working on this case since May 2017, so it is not a thing that just cropped up. “We are neither a political party nor politicians. We don’t have any relationship with what they are talking about. We are just doing our work. President Buhari had sacked Lawal on Oct. 30, 2017 following his indictment by a presidential panel that probed misuse of funds meant for Internally Displaced Persons in the North East. The former SGF is accused of using his company Rholavision Engineering Ltd to corner a N200m contract for the clearing of evasive plant species in Yobe. Amaddin said Lawal was still in detention as of Friday morning, and that the suspect was assisting the commission in its investigation. Asked whether the commission had a court warrant to detain him beyond the 48 hours prescribed by law, the spokesman said the commission’s legal team was “taking care of that’’. “We are aware of the law, and the legal team must have taken care of that,’’ he said.